Nokia has returned to the arms of Android and we should thank HMD for this. 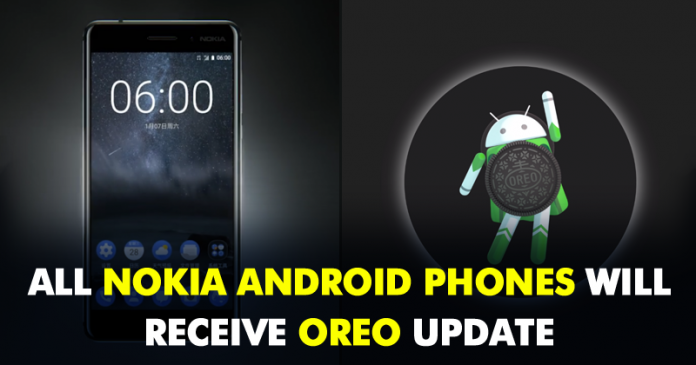 However, the brand focuses on the idea that its new smartphones will receive promptly all updates, hence, finally they confirmed that all Nokia smartphones will receive Android 8.0 Oreo Update. The Finnish company Nokia has returned to the arms of Android and we should thank HMD for this. The brand focuses on the idea that its new smartphones will receive promptly all updates to the operating system of Google, of course, Android. Today it has been confirmed that all Nokia mobile phones with Android will be upgraded to Android 8.0 Oreo, to the delight of all those interested in buying any of their smartphones. The head of HMD Global products, Juho Sarvikas, made things more or less official on Twitter, assuring users that even the Nokia 3, low-cost brand phone, will join the Oreo club in the coming months, since despite this confirmation there is no data on dates of when the latest version of Android would arrive. This news may not be too surprising for some, as the tech giant Google mentioned that the current mobile manufacturer Nokia, HMD Global and other companies are “scheduled to launch or upgrade new devices to Android Oreo 8.0 as soon as the system image becomes available”. These statements have been known since the release of the latest major version of its mobile operating system. However, back then the search engine giant did not mention any specific model in its key event, prompting some to speculate that the Nokia 3 could be left behind because it has a different processor than the Nokia 5 and Nokia 6. Therefore, it is nice to see Juho ending these rumors saying that all Nokia phones will feature Android 8.0 Oreo. As everyone knows, HMD Global likes to decorate their phones with an almost stock version of Android. This is done to ensure a bloatware free experience and, not least, timely updates. The company has promised at least two years of the operating system upgrade support for its devices, which means that the new Nokia 8 should also receive the next Android Oreo update.